Turn an unused cigarette lighter outlet in your car into two powerful USB charging ports that sit nearly flush to the surface of the outlet. 3.1A max output across two USB ports - simultaneously charge two devices at full speed. Advanced circuitry and built in safeguards protects your devices against excessive current, overheating, and over charging. All products are backed by our 45-Day Money Back Guarantee and 24-Month Product Replacement Warranty. 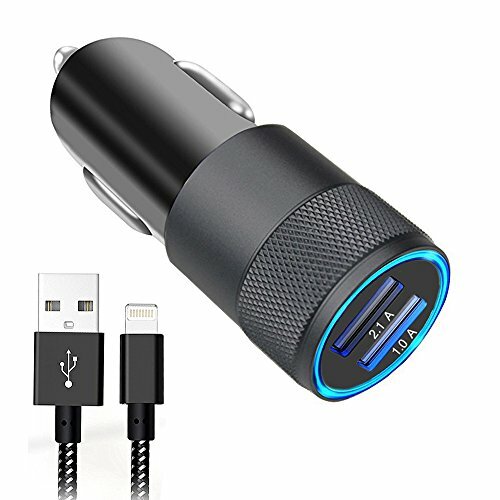 Perfect Compatibility:Dual Rapid USB Car Charger charges your favorite mobile devices including the iPad (max speed), iPhone (max speed), iPod, HTC, Galaxy, Blackberry, MP3 Players, Digital Cameras, PDAs, Mobile Phones. Compact Design:Simply carry an extra handy and light weight mini car charger usb adapter and you can charge your device anytime, anywhere on the way. Soft LED helps locate ports in the dark without being distracting. Quick Charge:Twin USB ports offer simultaneous high-speed charging for driver and passenger, to provide optimal charging efficiency automatically. Smart Protection:Intelligent circuit design protects against short circuiting,over-heating,over-current,and over-charging. Charging stops when battery is full. What You Get: 3.1A rapid iPhone car charger with 3 feet iPhone lightning cable, nylon braided design, 12-month worry-free product warranty and friendly customer service. If you have any questions, don't hesitate to contact us!